I have been exploring ways to dovetail the documentary methodology I've been using for the past several years with concept-driven projects. The other day I mentioned that Dan Zettwoch's Famous Fictional show provided an opportunity. Here are several spreads from an upcoming zine/serial project I'm working on that I devoted to Dan's show, two an Old MacDonald riff and one (at the top of this post) self-evidently a Simple Simon thing. 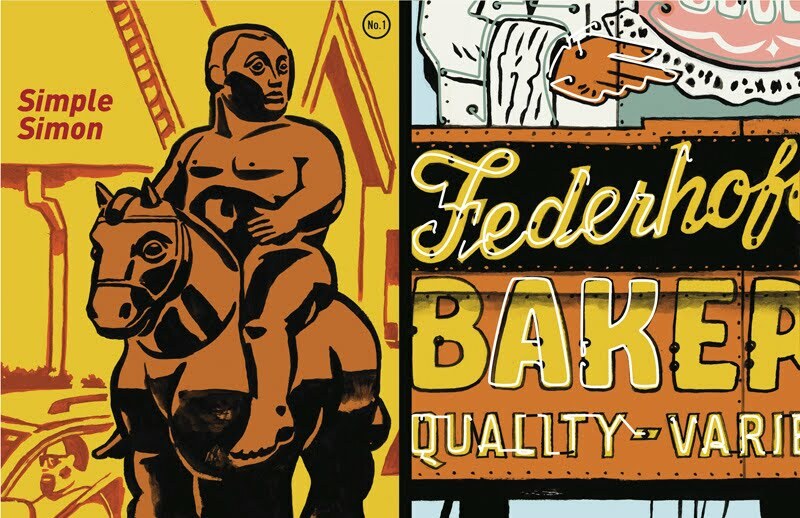 The Simple Simon sources are a Botero sculpture in Clayton, Missouri, near our old condo and the Federhofer Bakery sign on Gravois in St. Louis, a subject I worked with once before. The critters directly above were taken from the 2nd Presbyterian nursery/play area for children, which I work in every fourth Sunday (yes, I'll take them back!). All, that is, except the Chinese Allosaur, which is a remnant of our boys' childhoods. Even the goofy farm picture with the horse from the earlier post was seen, on a reference drive north and west of St. Louis a month or so ago. I posted a version of this awhile ago, but reworked the color and added the vehicles in the background to establish the space more effectively. Comment welcome–I'm pumped about these things, but curious about how they come across.